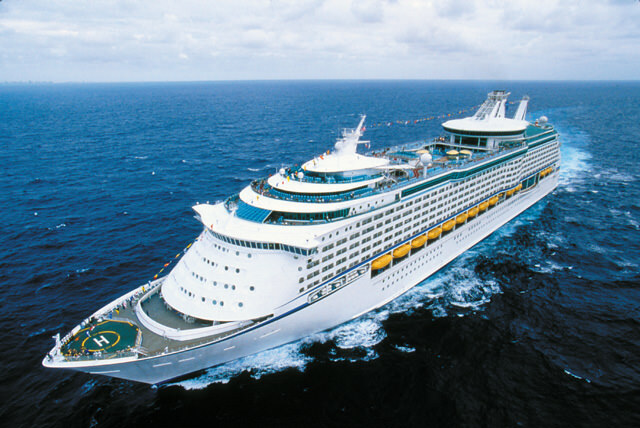 The ship that inaugurated the super-megaship era back in 1999, Voyager of the Seas is the model for everything Royal Caribbean’s done since, with an onboard atmosphere that’s bustling, active, and basically urban—they really are like cities at sea. Measuring in at 138,000 gross tons and carrying 3,114 guests at double occupancy, she and her identical Voyager-class sisters are still the eighth largest cruise ships in the world, and offer more in the way of leisure, sports, entertainment, dining, and kids’ experiences than almost anyone could have dreamed of before they were launched. In a very real sense, Voyager of the Seas changed what people thought possible aboard cruise ships. The hub of each of the Voyager-class ships is the Royal Promenade, a four-story horizontal atrium that stretches for about three quarters of the ship’s length and acts as a combination entertainment district and central meeting place. Along its length, there’s a sports bar, an elegant champagne bar, a Ben & Jerry’s ice-cream shop, a 24-hour cafe, five different shops, and a comfortable English-style pub with seating inside or on the promenade itself. Toward the bow, Cleopatra’s Needle offers live music, dancing, and entertainment. Voyager of the Seas’ Cleopatra Lounge. Photo courtesy of Royal Caribbean. Most guests end up spending a lot of time in or passing through the promenade, either hanging out to socialize; popping down briefly to grab a snack or coffee; coming for the parades of costumed characters and stilt-walkers that are scheduled several times a week; or just passing through when heading from one part of the ship to another. You can even sleep there if you want, sort of, in one of the 138 cabins whose windows face the Promenade, giving you views of the “street life” below. Curtains and soundproofing help shut out the light and noise at bedtime. Staterooms in general are comfortable and well-designed, though bathrooms are a little on the small side. Each cabin offers a sitting area, a vanity, TV, and minibar, and about half the rooms aboard offer private verandas. Suites range from the 265-square-foot Junior Suite up to the 1,087-square-foot Royal Suite, with its separate bedroom and living room, baby grand piano, whirlpool bath, and a balcony that’s larger than most standard staterooms on board. 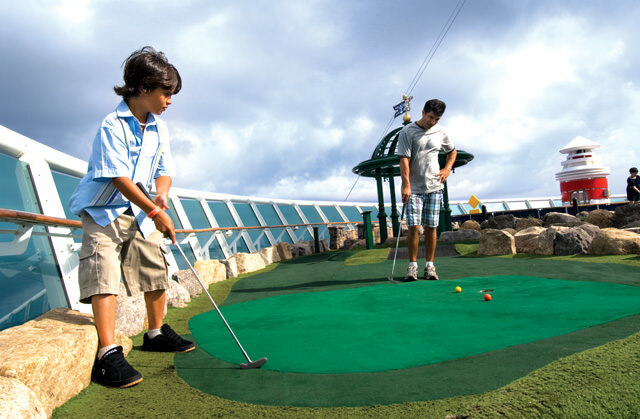 Like all the Voyager-class ships, Voyager of the Seas is big on sports, with Deck 13 offering a rock-climbing wall, a full-size basketball court, a miniature-golf course, and a rollerblading track. Just below, the ship’s two-level spa and fitness complex is one of the biggest and best at sea, with a large central whirlpool tub surrounded by a well-equipped oceanview gym, a huge aerobics studio, and individual treatment rooms. Just forward on Deck 11, the Solarium offers a large swimming pool and two oversized whirlpool tubs under a sliding roof. It’s a peaceful alternative to the multi-level main pool deck, with its two pools, multiple whirlpools, scores of deck chairs, and bandstand. Down on Deck 3, Studio B was the first ice-skating rink ever created aboard a cruise ship. Open skating for guests is scheduled throughout each cruise, but the room’s real highlight is its excellent ice shows, featuring professional skaters from all over the world. Other notable spaces on board include while the beautiful, three-story Coral Theater; a dungeon-themed disco called “The Vault,” which you enter through a suitably mysterious secret passage; the huge Casino Royale; the Aquarium Bar with its namesake aquariums lining the walls, full of colorful fish; and the elegant Viking Crown Lounge, cool High Notes jazz club, and golf-themed 19th Hole bar, all up on Deck 14. 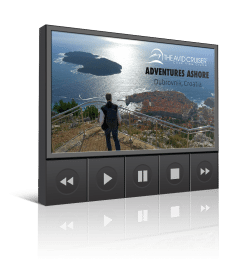 For kids, the Adventure Ocean center is perched up on Deck 12, offering activities for different age groups. There’s a teen disco and an arcade right next door, and just astern is a kids’ pool area with a water slide, wading pool, kids-size deck chairs, and a hot tub for adults. 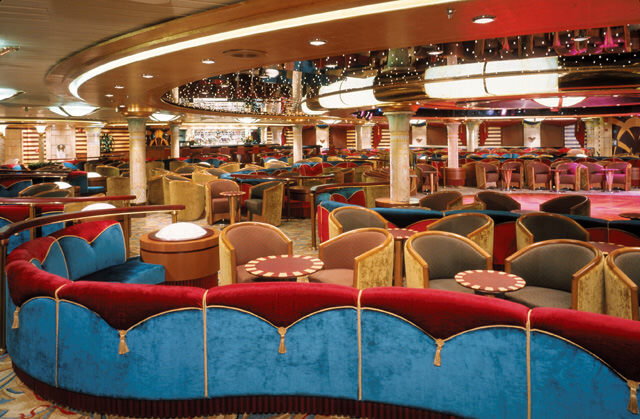 In the stern, the gorgeous main dining room is the centerpiece of the ship’s culinary experience. Designed with classic European grandeur, its three levels are centered on a large open area with a huge crystal chandelier, a formal stairway, and a balcony from which a pianist or piano trio plays mood music. Dining alternatives include the cozy, Italian Portofino restaurant; the Island Grill and Windjammer casual buffet restaurants, in one space but with separate stations to cut down on lines; and Johnny Rockets, a Fifties-style diner out on Deck 12 near the kids’ and teens’ centers, serving a classic menu of burgers, fries, and shakes. 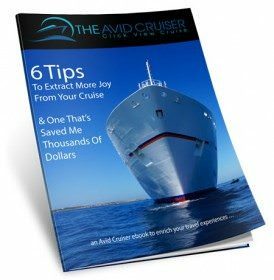 Want My Help With Your Royal Caribbean Cruise?